The new Falcon 1 rocket has been lost on its maiden flight. The US vehicle, developed by the Space Exploration Technologies Corp, was destroyed soon after take-off from the Marshall Islands in the Pacific Ocean. The vision of Elon Musk, co-founder of the electronic payment system PayPal, the Falcon was designed to cut the cost of current satellite launches. 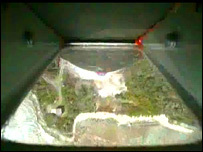 An onboard camera appeared to show the rocket rolling out of control shortly before the video signal was lost. SpaceX (Space Exploration Technologies Corp) spokeswoman Gwynn Shotwell told reporters on a conference call that there was about a minute of powered flight. "We do know that the vehicle did not succeed after that," she said. "Clearly this is a setback but we're in this for the long haul." And Elon Musk added: "We had a successful lift-off and Falcon made it well clear of the launch pad, but unfortunately the vehicle was lost later in the first-stage burn. More information will be posted once we have had time to analyse the problem." The vehicle left its launch pad on the Kwajalein Atoll at just after 2230 GMT. It was the fourth attempt at a flight; a number of technical issues had prompted SpaceX to delay the inaugural mission. The rocket was attempting to carry a 19.5kg satellite to a low-Earth orbit of 450km. The satellite, FalconSat-2, was built by US Air Force Academy cadets to investigate the phenomenon known as "space weather". The Falcon 1 is the first in a line of vehicles the SpaceX company hopes will shake up rocket services. It is a two-stage rocket powered by liquid oxygen and kerosene. The first stage is designed to parachute into the ocean to be recovered and used again. With the relatively low price of $6.7m (£3.8m) per flight, the Falcon 1 is making a serious attempt to undercut other players in what is an overcrowded launcher market. At a length of 21.3m, Falcon 1 is the smallest in the Falcon family. The largest, the 53m-long Falcon 9, is scheduled to launch in late 2007, and should be able to carry about 25,000kg into low-Earth orbits. This would put it in a similar class to current American vehicles such as the Delta 4 or Atlas 5, and the European Ariane 5. Prior to Friday's launch attempt, SpaceX said it already had nine launch contracts in place representing nearly $200m.